Triradius: Formed due to confluence of three ridge systems. In dentistry, review of literature shows a meager number of studies to establish a relationship between finger patterns and the disease process. Kharbanda et al.,  in 1982, conducted a study on 25 North Indian males by with true mandibular prognathism which was confirmed with cephalometric Down's analysis. They compared this with the dermatoglyphic findings of individuals with Class I occlusion and craniofacial pattern. 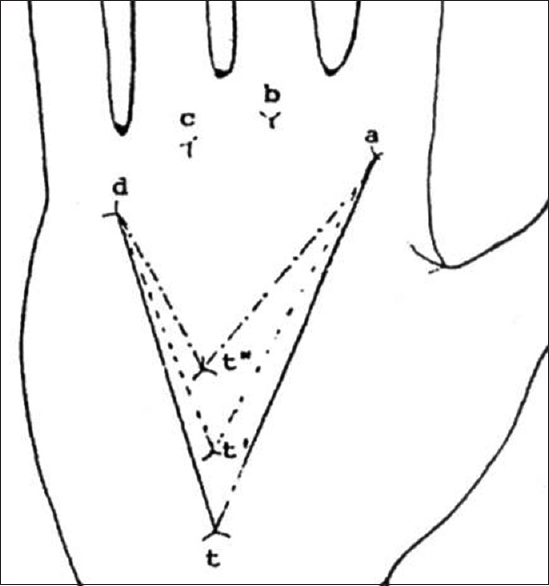 They stated in their study that the craniofacial skeletal Class III pattern was associated with an increase in arches and ulnar loops at the expense of whorls on all digits except digit II, there was an increased frequency of whorls and radial loops, and an increased frequency of carpel loops on interdigital area of palms. In 1986, Kanematsu et al. studied dermatoglyphic patterns in 311 children who were diagnosed with cleft lip, alveolus, and palate without any external malformations. They compared these patterns with those of the normal children. They found that the etiology of the abnormalities in the appearance of finger and palm prints was influenced by genetic factors during the embryonic period. Lakshmi  conducted a study in 1989, where they studied the fingerprint patterns of twenty patients with hypodontia and compared with those of twenty normal males and 20 normal females. The frequency of whorls and arch patterns was more compared to that of the loop patterns in individuals with hypodontia as compared to normal females. An increased frequency of whorls and decreased frequency of loops and arch patterns were found as compared to normal males. In 1997, the study was conducted by Reddy et al. where dermatoglyphics was used to predict and compare Class I, Class II division 1, division 2, and Class III malocclusion. The study revealed that increased frequency of arches and ulnar loops and decreased frequency of whorls were associated with craniofacial Class II division 1, division 2. Class III malocclusion was associated with an increased frequency of arches and radial loops with decreased frequency of ulnar loops. A study was undertaken by Trehan et al. in 2000 to analyze and compare the dermatoglyphic patterns of patients with normal occlusion and various classes of malocclusion. The study showed an association of increased frequency of radical loops and arches with Class I and Class II division 1 malocclusions. Furthermore, an association of an increased frequency of whorls with Class I and Class III malocclusion was seen when compared to normal occlusion. A study was conducted by Reddy et al. in 2013 in an attempt to compare the dermatoglyphic patterns of individuals with normal occlusion and various classes of malocclusions. Particular predictive occurrence of patterns was not found to be associated with each group, but some of the fingerprint patterns such as twinned loops were seen with an increased frequency in Class II malocclusions and radial loops were absent in Class III malocclusions. Rajput et al. conducted a pilot study on 24 patients with ten Class I, eight Class II, and six Class III malocclusion. The dermatoglyphic patterns collected were evaluated quantitatively and qualitatively. The study revealed that there was an increased frequency of whorls in Class I malocclusion patients and an increased frequency of loops in Class II and Class III malocclusion patients. Dermatoglyphics is an upcoming area of interest. Its use as a marker for various conditions is still in its initial stages. From the above-mentioned studies, it can be said that there is an association between various malocclusions and different dermatoglyphic patterns. However, whether dermatoglyphics alone can be considered as a factor to diagnose malocclusion is still questionable. More studies with larger sample size involving various ethnic and racial backgrounds are required to establish this. If dermatoglyphics are proven to be an acceptable diagnostic tool, it can help in identifying malocclusion at an early age and thus help in preventive and interceptive treatment. Verbov J. Clinical significance and genetics of epidermal ridges - A review of dermatoglyphics. J Invest Dermatol 1970;54:261-71. Jindal G, Pandey RK, Gupta S, Sandhu M. A comparative evaluation of dermatoglyphics in different classes of malocclusion. Saudi Dent J 2015;27:88-92. Reddy BR, Sankar SG, Roy ET, Govulla S. A comparative study of dermatoglyphics in individuals with normal occlusions and malocclusions. J Clin Diagn Res 2013;7:3060-5. Kobyliansky E, Bejerano M, Katznelson MB, Malkin I. Relationship between genetic anomalies of different levels and deviations in dermatoglyphic traits. Stud Hist Anthropol 2004;4:61-121. 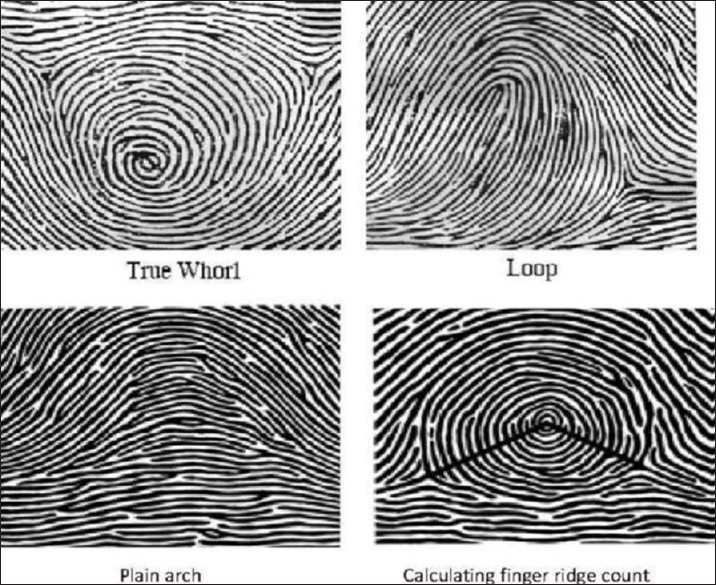 Galton F. Finger Prints. London: McMillan; 1982. Nabar BS. Forensic Science in Crime Investigation. Hyderabad: Lowhouse; 2006. Prabhu N, Issrani R, Mathur S, Mishra G, Sinha S. Dermatoglyphics in health and dieases - A review. J Res Adv Dent 2014;3:20-6. Gupta V, Kumar P, Dupare R, Datta SS. Dermatoglyphics and dental caries: A review. IJFO 2011;4:33-7. Miller JR, Giroux J. Dermatoglyphics in pediatric practice. J Pediatr 1966;69:302-12. Jurgensen AP, Kosz D. Fingerprint Verification for Use in Identity Verification System. Aalborg University; 1993. p. 257-80. Babu DB, Asif SM. Dermatoglyphics in dentistry: A review. Int J Contemp Dent Med Rev 2015;1-3. Kharbanda OP, Sharma VP, Gupta DS. Dermatoglyphic evaluation of mandibular prognathism. J Indian Dent Assoc 1982;54:179-86. Kanematsu N, Yoshida Y, Kishi N, Kawata K, Kaku M, Maeda K, et al. Study on abnormalities in the appearance of finger and palm prints in children with cleft lip, alveolus, and palate. J Maxillofac Surg 1986;14:74-82. Lakshmi V. Dermatoglyphics and orthodontics - A review. Ann Essences Dent 2013;5:30-3. Reddy S, Prabhakar AR, Reddy VV. A dermatoglyphic predictive and comparative study of Class I, Class II, Div. 1, Div. 2 and Class III malocclusions. J Indian Soc Pedod Prev Dent 1997;15:13-9. Trehan M, Kapoor DN, Tandon P, Sharma VP. Dermatoglyphic study of normal occlusion and malocclusion. J Indian Orthod Soc 2000;33:11-6. Rajput S, Shenoy S, Thoke B. Palmar dermatoglyphics verses malocclusion: A pilot study. IJRID 2014;4:48-56.